(CNN) – If you're dissatisfied with the economy, or unemployed, Herman Cain thinks you should take a long, hard look in the mirror. In an interview with the Wall Street Journal posted Wednesday, the up-and-coming GOP 2012 contender and former CEO of Godfather's Pizza summed up his bewilderment about recent demonstrations on Wall Street. 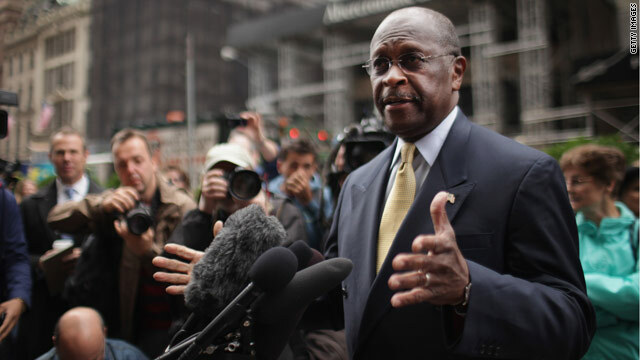 "Don't blame Wall Street," Cain said. "Don't blame the big banks. If you don't have a job and you're not rich, blame yourself." The conservative radio talk show host described the protests as "planned and orchestrated to distract from the failed policies of the Obama administration, though he admitted he didn't "have the facts to back this up." Demonstrators have gathered to protest big banks during the "Occupy Wall Street" movement, but their grievances don't end with the economy. The protesters, mainly youth in their twenties, have addressed issues from police brutality to union busting, although they are also upset with the war in Afghanistan, the environment, and the state of the world in general. The "Occupy Wall Street" movement has also drawn support from unions. But for Cain, the demonstrations simply amount to "anti-capitalism." Allowing the banks had a "big part" in the 2008 economic crisis, the candidate, who's known for his bombast and has been rising in national polls pointed out, "We're in 2011, okay?" "When I was growing up I was blessed to have had parents. That didn't teach me to be jealous of anybody and didn't teach me to be jealous of somebody," Cain explained. "It is not a person's fault because they succeeded. It is a person's fault if they failed. And so this is why I don't understand these demonstrations and what is it that they're looking for." Cain spokesman JD Gordon declined to add a comment on the candidate's interview. Cain doesn't utilize any form of "logic." I can't figure out just who he thinks he is. I doubt he will admit to being an imbecile, at least not until the election's over and his photo-ops are over. Cain is part of the problem. He was a CEO. They are a very insidious bunch. They all know each other. They all know how much each other makes, so they demand that they make as much or or more. They all sit on each others boards so award each other as much as they ask for. They are the aristocracy of the 20th and 21st century. Any one who works for a living is, well, the hired help. They are "excessive labor costs." From the CEO point of view, labor costs too much in the US. Costs are to be reduced for the benefit of shareholder value, return on investment, quarterly returns. All of those calculations determine what is most important, bonus and stock option calculations for the CEO and his/her senior management team. Everything else is expendable. This is "The Market." We must all bow down, and thank "The Market" for what it bestows on our Senior Management Team as they make business decisions. Too bad you lost your job. It's your fault. God Save The Market and The Republican Party! Sorry, my point (in case it wasn't obvious) is that I no longer have as much money as I use to in my retirement account due to the economy.. But it is obviously it was my fault that I invested and trusted people to not scheme/scam the public. Guess we all should have put our hard earn money in a mattress... it's the public's fault the economy trashed.